Princess Lalla Hasnaa represented King Mohammed VI at the official inauguration ceremony of Qatar National Library (QNL), on Monday in Doha. The ceremony was chaired by Emir of Qatar Sheikh Tamim bin Hamad al-Thani, who commemorated the event by placing the library’s one-millionth book, a rare 843-year-old manuscript copy of Sahih Al Bukhari, on the shelves of QNL, local media reported. The first book on the shelves of QNL was placed by Sheikha Moza, Chairperson of Qatar Foundation, in December 2016. 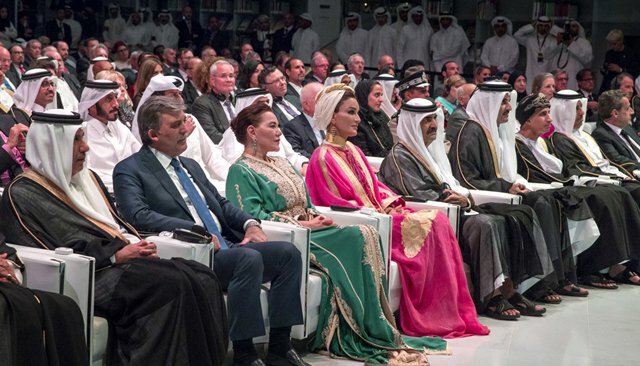 “The inauguration of Qatar National Library invokes a great sense of historical pride and belonging to the Arab world, which pioneered writing, transcription, and libraries in Mesopotamia 5,000 years ago,” Sheikha Moza said in an opening address. The library was established to be a treasury of written history and a medium for the transfer of knowledge between different cultures, she said. “We aspire to make this library a modern mechanism to revive the Arabic language and to re-establish its presence as a marker of civilization. Through a new interpretation of our heritage, we can restore the days when Arabic was the universal language of the Middle Ages. When it was synonymous with science and culture, and a source of pride. It was a well-known fact: You speak Arabic, then you are educated,” she said, adding that the library will essentially be an institution of reference for Arabic and Islamic heritage and a platform for spreading contemporary intellectual and literary thought. Princess Lalla Hasna and the other guests toured the different sections of the library before taking part in a dinner banquet hosted by the Emir of Qatar in honor of the attending delegations. Posted by Jaber Ali on Apr 17 2018. Filed under Gulf News, Headlines. You can follow any responses to this entry through the RSS 2.0. Both comments and pings are currently closed.